One of my favorite things about public relations is I never know what to expect. Once in a while, I receive a phone call with an out-of-the-ordinary request or client need. This call came from Mike Warner who was the number two person at the New Jersey Department of Military and Veterans Affairs during the Whitman Administration. The call, which came back in 1998, went something like this, “Hi Liz. The Governor wants to bring the Battleship New Jersey back to the state, and I was wondering if you wanted to help.” My first thought was, “Wait, what? Help you how?” But I jumped at the opportunity, and that’s where my relationship began with some wonderful people and a project that will live in my mind forever. 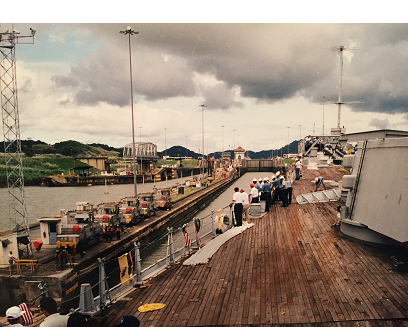 The answer to how we could help came with the assignment to help tell the historic story of the Battleship’s voyage home and the organizing of an event in Panama. The story began with an event in Bremerton, Washington where the Battleship was tied to a tug boat and literally towed along the west coast, through the Panama Canal, with a stop at the Philadelphia Naval Yard, and finally to her berth in Camden. I didn’t know when I signed on to help that I would wind up in Panama, twice, planning the event to celebrate the Battleship’s passage. 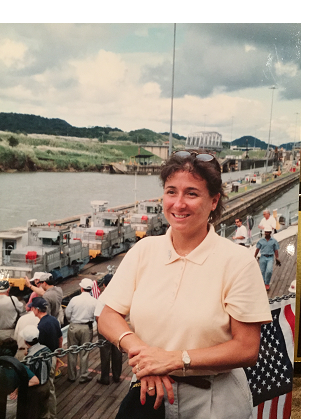 My fearless, faithful friend Carol Beske said, “I’ve never been to Panama. I’ll go, too.” So my buddy Carol joined Rachel Donington and me for a flight to Panama. We couldn’t believe how fortunate we were to have such an incredible experience. Since the Panamanian ambassador had once lived in Livingston, NJ, he couldn’t have been more welcoming to us and our delegation. Fast-forward to the day the powerless Battleship entered the Panama Canal towed by a tug boat. Governor Whitman, John Whitman, Senator Frank Lautenberg and more than 300 New Jersey residents made their way to Panama to witness the historic passage. The ship entered the locks greeted by line handlers and the cheers of our guests, many of whom were veterans who had served on the Battleship New Jersey during war times. The ship’s sides scraped the walls of the canal, as the clearance was a mere six inches. We laughed. We cried. We listened to veterans’ stories. We watched the Governor and Mr. Whitman hand out New Jersey state “pins” to the line handlers who gladly accepted them while high-fiving the Whitmans. I often think back on that once in a lifetime request from Mike Warner, and I’m so glad he asked for my help. I wonder where my next unexpected request will come from.